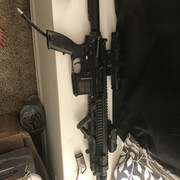 Hi I have a vfc m27 for sale or trade. The bbs aren't feeding properly right now . Might need a new bucking . What ever it is it can't be to hard to fix in just in experienced in tech work. I would like to trade for another m4 style p* or highly upgraded age build for high rof. 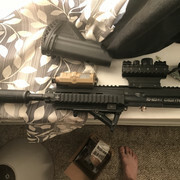 I have 2 complete uppers for it . My number is 7755239503 text me or reply here with comments ,questions or concerns . Both uppers are fully upgraded with internals. Excuse me fire how much of a noob I sound like. This should be posted over in the Commerce section. That's where all buy/sell/trade posts are made. This section is more for discussing certain platforms, reviews and other bits related to Gas platforms.